Since ridership determines the scale of a rapid transit system, statistical modeling allows planners to size the rail system for the needs of the area. When the predicted ridership falls between the service requirements of a light rail and heavy rail or metro system, an MCS project is indicated. An MCS may also result when a rapid transit service fails to achieve the requisite ridership due to network inadequacies (e.g. single-tracking) or changing demographics. In contrast with most light rail systems, an MCS usually (though not always) runs on a fully grade separated exclusive right-of-way. In some cases, the distance between stations is much longer than typically found on heavy rail networks. An MCS may also be suitable for branch line connections to another mode of a heavy-capacity transportation system, such as an airport or a main route of a metro network. The definition of a medium-capacity system varies due to its non-standardization. Inconsistencies in international definitions are even reflected within individual countries. For example, the Taiwan Ministry of Transportation and Communications states that each MCS system can board around 6,000–20,000 passengers per hour per direction (p/h/d or PPHPD), while the Taiwan Department of Rapid Transit Systems (TCG) suggests an MCS has a capability of boarding around 20,000–30,000 p/h/d, and a report from the World Bank places the capacity of an MCS at 15,000–30,000 p/h/d. For comparison, ridership capacity of more than 30,000 p/h/d has been quoted as the standard for metro or "heavy rail" standards rapid transit systems, while light rail systems have passenger capacity volumes of around 10,000–12,000 p/h/d or 12,000–18,000 p/h/d. Generally speaking, medium capacity systems has a lower ridership capacity when compared to other heavy rail systems in the same area. However, passenger capacity volume is just one possible criterion used to define a medium-capacity rail transit system. Another criterion that can be used to define a medium-capacity rail system is vehicle type. For example, the train in an MCS may have a shorter configuration than the standard metro system, usually three (though, in some cases, just two) to six traincars, allowing for shorter platforms to be built and used. Rather than using steel wheels, rubber-tyred metro technology, such as the VAL system used on the Taipei Metro, is sometimes recommended, due to its low running noise, as well as the ability to climb steeper grades and turn tighter curves, thus allowing more flexible alignments. Fully heavy rail or metro systems generally have train headways of 10 minutes or better during peak hours. Some systems that qualify as heavy rail/metro in every other way (e.g. are fully grade separated), but which have network inadequacies (e.g. a section of single track rail) can only achieve lesser headways (e.g. every 15 minutes) which result in lower passenger volume capacities, and thus would be more accurately defined as "light metro" or "medium-capacity" systems as a result. "Light metro" is a common alternative term used to describe the system worldwide. The term is used in European countries, India, and South Korea. As mentioned above, VAL (Véhicule Automatique Léger) systems are categorized in the medium-capacity rail systems family because their manufacturer defines their passenger capacities as being up to 30,000 p/h/d. In Hong Kong, MTR's Ma On Shan Line could, in some contexts, be classified as a MCS (as it has used shorter four-car SP1950 trains) but can attain up to 32,000 p/h/d which is comparable to the passenger capacity of some full metro transit networks. This classification will not last for much longer as full-length, 8-car trains are being deployed on the line in advance of its merger with the West Rail Line to form the East West Corridor by 2019. Two other lines, the Disneyland Resort Line shuttle service to Hong Kong Disneyland Resort since 2005 and the South Island Line since December 2016, are also built to MCS standards. The main reason to build a light metro instead of a regular metro is to reduce costs, mainly because this system employs shorter vehicles and shorter stations. Light metros may operate faster than heavy-rail rapid transit systems due to shorter dwell times at stations, and the faster acceleration and deceleration of lighter trains. For example, express trains on the New York City Subway are about as fast as the Vancouver SkyTrain, but these express trains skip most stops on lines where they operate. Medium-capacity systems have restricted growth capacities as ridership increases. For example, it is difficult to extend station platforms once a system is in operation, especially for underground railway systems, since this work must be done without interfering with traffic. Some railway systems, like Hong Kong and Wuhan, may make advance provisions for longer platforms, for example, so that they will be able to accommodate trains with more, or longer cars, in the future. Taipei Metro, for example, constructed extra space for two extra cars in all its Wenhu Line stations. The following is the list of currently-operating MCSs which are categorized as light metros by the Light Rail Transit Association (LRTA), unless otherwise indicated. Toronto Toronto subway: Line 3 1 1985 Categorized by APTA as being "intermediate rail" (i.e. between "heavy rail" and "light rail"), and categorized as a "light metro" by LRTA. Vancouver SkyTrain 3 1985 While using equipments typically employed in medium capacity systems, the Expo and Millennium lines start to approach that of than of full "rapid transit" since they now operate with longer 4- and 6-car Bombardier INNOVIA ART trains. However, the Canada Line currently operates with 2-car trains. China Guangzhou Zhujiang New Town Automated People Mover System 1 2010 The system uses 14 Bombardier Transportation's APM 100 cars built in Pittsburgh, Pennsylvania. (Penny's Bay Rail Link) 1 2005 Trains: 3 compartments without drivers. Some of the M-Train cars used in the Disneyland Resort Line were originally ordered from 1994–1998 as subtype H-Stock train (Phase 3 EMU, A/C 270-291, B/C 486-496). Units A/C274 A/C281 A/C284 A/C289 A/C291 and B/C490 are now used on the Disneyland Resort Line. South Island Line 1 2016 Trains: 3-car S-Trains Categorized as a "Medium-capacity rail transport system". Denmark Copenhagen Copenhagen Metro 2 2002 Driverless vehicle system. Trains: 3-car config., 39 metres length. France Lille Lille Metro 2 1983 VAL people mover system. Trains: 2-car config., 26 metres in length, with a maximum passenger capacity of 208–240 per train (depending on VAL 206 or VAL 208 train). 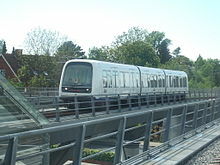 Nevertheless, UrbanRail.net describes it as a "new generation of metro systems". Paris Orlyval 1 1991 VAL people mover system, using VAL 206 vehicles. Rennes Rennes Metro 1 2002 VAL people mover system – while trains have 80 second headways, they can only carry 158 people per train. Toulouse Toulouse Metro 2 1993 Although a VAL system, LRTA defines the system as "Metro." On the other hand, UrbanRail.net describes it as a "light metro VAL system". India Gurgaon Rapid Metro Gurgaon 1 2013 Driverless vehicle system. The line is designed to carry up to 30,000 passengers per hour. Several articles define the system as "light metro." Italy Brescia Brescia Metro 1 2013 Trains: 3-car config, 39 metres length. Catania Catania Metro 1 1999 Single-tracked at-grade section limits headways to 15 minutes. Currently 9 km of double track extension are under construction, 5 km of which is scheduled to open in 2016. Genoa Genoa Metro 1 1990 Generally considered to be a "light metro" considering its low frequency, limited hours of operation and reduced transport capacity. It is actually categorized as "light rail" by LRTA. Milan Milan Metro: Line 5 and Line 4 2 2013, 2020 (planned) Line 4 is under construction. Driverless vehicle system. Trains: 4-car configuration, 50.5 metres length, capacity for 536 passengers maximum. Naples Naples Metro 1 1993 Line 6 is categorized as "light metro", with only 16 minute headways. Line 1 has a single-tracked tunnel section. Perugia MiniMetro 1 2008 LRTA defines the system as a "light metro," while they regarded the same system in Laon, which ceased in 2016, as a "cable monorail." Turin Turin Metro 1 2006 VAL people mover system. Japan Hiroshima Astram Line 1 1994 Driverless vehicle system. A small part of the underground section was built as Metro system. Kobe Kobe New Transit 2 1981, 1990 Trains: Port Island Line and Rokkō Island Line. Both consist of 4-car config (300 people per train), but the platforms are made for fitting to 6-car config. Osaka Nankō Port Town Line 1 1981 Trains: 4-car config, but the platforms are designed to apply to 6-car. Saitama New Shuttle 1 1983 Trains: 6-car config, rubber-tyred and operated manually. Sakura Yamaman Yūkarigaoka Line 1 1982 Trains: 3-car config (205 people per train). An AGT with center-guideway system. Because of the form, LRTA defines the system as a monorail. Tokorozawa Seibu Yamaguchi Line 1 1985 Trains: 4-car config (302 people per train), rubber-tyred and operated manually. Not mentioned LRTA nor UrbanRail.net. Tokyo Nippori-Toneri Liner 1 2008 Trains: 5-car config, driverless vehicle system. Yurikamome 1 1995 Trains: 6-car config, driverless vehicle system. Yokohama Kanazawa Seaside Line 1 1989 Driverless vehicle system. Malaysia Kuala Lumpur Rapid KL - LRT Kelana Jaya, LRT Ampang and LRT Sri Petaling 2 1998 Bombardier INNOVIA ART 200 Trains: Mixed 2-car, 4-car config. fleet. Philippines Manila Manila Light Rail Transit System Line 1 (Line 1) 1 1984 Trains: LRT-1 Line began with 2-car configuration, reconfigured to 3-car in 2004, and procured new 4-car configurations in 1999 and 2007..
Manila Metro Rail Transit System Line 3 (Line 3) 1 1999 Trains: 3-car config., with a max. capacity of 1,182 passengers, and running with 4–5 minute headways. However, line is designed for 23,000 p/h/d capacity. Categorized as "light rail" by LRTA..
Singapore Singapore Singapore MRT: Circle Line, Downtown Line, Thomson-East Coast Line(future) and Jurong Region Line(future) 4 (1u/c and 1 under planning) 2009, 2013, 2019, 2025 (predicted) The Circle Line rolling stock consists of the AlstomC830 and C830C in 3 car formations with a maximum capacity of 931 passengers. The Downtown Line rolling stock consist of the Bombardier C951 & C951a also in a 3 car formation with a maximum capacity of 931 passengers. The Thomson-East Coast Line rolling stock consists of the Kawasaki/Sifang CT251 in a 4 car formation with a maximum capacity of 1,280 passengers. The Jurong Region Line is still under planning, the rolling stock is to be confirmed in future, but it has stated that the line will be a "medium capacity" MRT line. South Korea Busan Busan Metro Line 4 1 2009 Unmentioned by LRTA, though UrbanRail.net categorizes the line as a "light metro." Busan–Gimhae Light Rail Transit 1 2011 Driverless vehicle system. Trains: 2-car config. Unmentioned by LRTA, but the operator calls the system "light rail". Seoul Ui LRT 1 2017 Each train consists of 2-car trains and runs unmanned. Uijeongbu U Line 1 2012 VAL driverless system. Trains: 2-car config. Categorized as a "light metro" by LRTA and elsewhere, though there are also articles categorizing it as "Light Rail." Spain Barcelona Barcelona Metro: Line 8 and Line 11 2 2003 Driverless vehicle system. Trains: 2-car config. LRTA also categorizes Line 8 as "light metro." Málaga Málaga Metro 1 2014 System contains at-grade intersections on surface section of Line 1. Described as a "light metro" by at least one rail publication. Palma, Majorca Palma Metro: Line M1 1 2007 Mostly underground line operates with just 15-minute headways and two-car trains (306 passengers max. ); one reference even categorizes line as "light rail". Seville Seville Metro 1 2000 Trains: 31 metres length with a max. capacity of 192 passengers. Taiwan Taipei Taipei Metro: Brown Line (Line 1) and Yellow Line 2 1996, 2019 (planned) Brown Line (Line 1) – Trains: Rubber-tire system; 4-car config; categorized as a part of the "metro" by LRTA. Yellow Line - planned to open in 2019, will use AnsaldoBreda Driverless Metro vehicles, and is categorized as a "light metro" by LRTA. Turkey Ankara Ankaray Light Metro (A1 Line) 1 1996 Trains: 3-car config, approx. 90 metres length. Categorized as a "light rail" by LRTA, though Current capacity: 27,000 p/h/d. M1 Line (Istanbul Hafif Metro) 1 1989 Trains: 4-car config. "Hafif Metro" literally translates as "Light Metro". Categorized as a "light rail" by LRTA. United Kingdom Glasgow Glasgow Subway 1 1896 Gauge: 4 ft (1,219 mm). Trains: 3-car config. London Docklands Light Railway 7 1987 Driverless vehicle system. Trains: generally 2–3-car config. Categorized as a "light rail" by LRTA. United States Miami Metromover 3 1986 Considered to be a "people mover". (part of the SEPTA rail system) 1 1907 Has been categorized by APTA as being "Light rapid rail transit" (i.e. between "rapid transit (heavy rail)" and "light rail"). Venezuela Maracaibo Maracaibo Metro 1 2006 Trains: 3-car trainset config, ~58 metres length (originally designed for Prague Metro). Categorized as a "light rail" by LRTA. Valencia Valencia Metro 1 2007 Trains: 2-car Siemens SD-460 config, ~55 metres length. Categorized as a "light rail" by LRTA. Line 3 - began with 3-car configuration, changed to 6-car in 2010. Peachliner - abandoned on 30 September 2006. ^ The french term"Métro léger," a literal translation of "Light Metro," means Light rail. ^ Allport, Roger (1996). "Theme Paper 6: Investment in mass rapid transit". In Stares, Stephen; Zhi, Liu (eds.). China's Urban Transport Development Strategy: Proceedings of a Symposium in Beijing, November 8-10, 1995 (PDF). Washington D.C.: The World Bank. p. 257. Retrieved 31 August 2015. ^ "Transportation term definition" (in Chinese). Ministry of Transportation and Communications (MOTC). Retrieved 2008-06-30. ^ "Comparison between high capacity and medium capacity systems" (in Chinese). Taiwan Department of Rapid Transit Systems, TCG. Archived from the original on July 23, 2013. Retrieved 2008-06-30. ^ a b Cledan Mandri-Perrott (2010). Private Sector Participation in Light Rail-Light Metro Transit Initiatives (pdf). Public-Private Infrastructure Advisory Facility (PPIAF) (Report). The World Bank. p. 17. Retrieved 2015-08-30. ^ a b Great Britain: Parliament: House of Commons: Transport Committee, ed. (2005). Integrated Transport: The Future of Light Rail and Modern Trams in the United Kingdom. The Stationery Office. p. 216. Retrieved 2014-02-22. ^ Robert Schwandl (2007). "What is a metro?". UrbanRail.Net. Retrieved 2014-02-22. ^ "Kerala opts for light metro, not monorail". business-standard.com. 2014-10-24. Retrieved 2014-11-29. ^ "BJP promises light metro in Bhopal and Indore". dnaindia.com. 2014-11-21. Retrieved 2014-11-29. ^ a b c "Korean city opens automatic light metro". Rail Journal.com. Retrieved 2014-11-24. ^ "경전철". Korea Rail Network Authority, Railway terminolgy dictionary(철도용어사전). Retrieved 20 October 2016. ^ "경전철". Bakmungak(박문각), Genaral current affair knowledge dictionary(시사상식사전), version revised at 06th may 2015. Retrieved 20 October 2016. ^ "경전철". doopedia(두산백과). Retrieved 20 October 2016. ^ "경전철". Korea Railway Industry Informaition Center(철도산업정보센터). Retrieved 2019-04-06. ^ a b "Uijeongbu Light Rail Transit, South Korea". Railway-technology.com. Retrieved 2014-02-22. ^ a b "Busan-Ginhae Light Rail Transit". Archived from the original on 2012-03-28. ^ "RT's 'double loop' system expected to cut waiting time for Kelana Jaya line". New Straits Times. 2018-12-31. Retrieved 2019-04-21. ^ "Kajang-Putrajaya rail link may be revived". The Star. 2019-04-15. Retrieved 2019-04-21. ^ "Malaysia enters new era for more efficient transportation network". The Sun . 2017-12-24. Retrieved 2019-04-21. ^ Ajay Kumar (2012-09-20). "Light rail could be alternative mode of transport in future". India today. Retrieved 2015-11-05. ^ Michael Taplin (March 2013). "Index of Countries + Totals for each Country". Light Rail Transit Association (LRTA). Retrieved 2014-11-28. ^ "VAL and NeoVAL". Siemens TS. Archived from the original on 2008-06-26. Retrieved 2008-06-30. ^ "MTR train frequencies of railway lines in different periods, number of cars on each train, train carrying capacity, train loading rates and number of seats" (pdf). MTR. Retrieved 2014-08-23. ^ "Transit Ridership Report Fourth Quarter and End-of-Year 2014" (pdf). American Public Transportation Association (APTA). 3 March 2015. p. 34. Retrieved 2015-03-14 – via http://www.apta.com/resources/statistics/Pages/ridershipreport.aspx. ^ Ltd, DVV Media International. "Guangzhou peoplemover enters service". Railway Gazette. ^ Robert Schwandl (2004). "Lille". UrbanRail.net. Retrieved 2016-02-22. ^ Robert Schwandl (2004). "Toulouse". UrbanRail.net. Retrieved 2014-11-29. ^ a b "Rapid MetroRail Gurgaon opens". Railway Gazette International. 15 November 2013. Retrieved 2014-12-28. ^ a b Simon Crompton-Reid (18 November 2013). "Rapid MetroRail Gurgaon launched". Total Rail. Archived from the original on 28 December 2014. Retrieved 2014-12-28. ^ a b "Gurgaon automated metro". Subways.net. Retrieved 2014-12-28. ^ "FOTO | Metropolitana, il cronoprogramma ufficiale". Mobilita Catania. 9 May 2015. Retrieved 2015-10-14. ^ Robert Schwandl (2010). "Kuala Lumpur". UrbanRail.net. Retrieved 2015-08-29. ^ "About Us - Background". Metro Rail Transit. Archived from the original on May 8, 2014. Retrieved June 8, 2014. ^ Robert Schwandl (2007). "Busan". UrbanRail.net. Retrieved 2014-11-30. ^ "Malaga metro problems - before work's even started". EuroweeklyNews. 27 March 2014. Retrieved 2014-07-30. ^ Puente, Fernando (30 July 2014). "Malaga light metro network opens". International Railway Journal. Retrieved 2014-07-30. ^ "Mallorca Rail Development, Spain". Railway-Technology.com. Retrieved 2014-05-16. ^ "TEKNİK ÖZELLİKLER" [TECHNICAL SPECIFICATIONS] (in Turkish). Ankaray LRT. Archived from the original on 2014-05-25. Retrieved 2014-05-24. ^ "American Public Transportation Association - A MULTIMODAL TOUR OF THE DELAWARE VALLEY" (PDF). American Public Transportation Association (APTA). June 1, 2013. Archived from the original (PDF) on November 11, 2013. Retrieved 2013-11-10. "Metros: Keeping pace with 21st century cities". uitp.org. International Association of Public Transport (French: L’Union internationale des transports publics (UITP)).